LPC LAHORE: Heroics of Sufi M Amir and Hissam Ali Hyder helped Master Paints Black outclassed Army Red by 5-1½ in the Master Paints Polo Cup 2018 match played here at the Lahore Polo Club (LPC) ground on Wednesday. Sufi Amir and Hissam Hyder both remained instrumental with mallot and ponies throughout the match and banged in a brace each in Master Paints Black’s triumph while Saqib Khan Khakwani contributed the remaining one. The only goal from the losing side came from Miguel Luis Duggan. Saqib Khakwani started the match by firing a fantastic field goal and gave Master Paints 1-0 lead. The second chukker saw in-form Sufi Amir displaying superb polo skills and pumping in two impressive goals to stretch his team’s lead to 3-0 while in the dying moments of the chukker, Hissam converted fabulous field goal to further enhance his team’s lead to 4-0. The third chukker of the match remained goalless while in the fourth and last chukker, Hissam struck another field goal to give his team unassailable 5-0 lead. In the dying moments of the final chukker, Mighuel Luis Duggan scored a consolation goal to finish the match at 5-1. Bilal Haye and Silvestre Garrose supervised the match as field umpires. 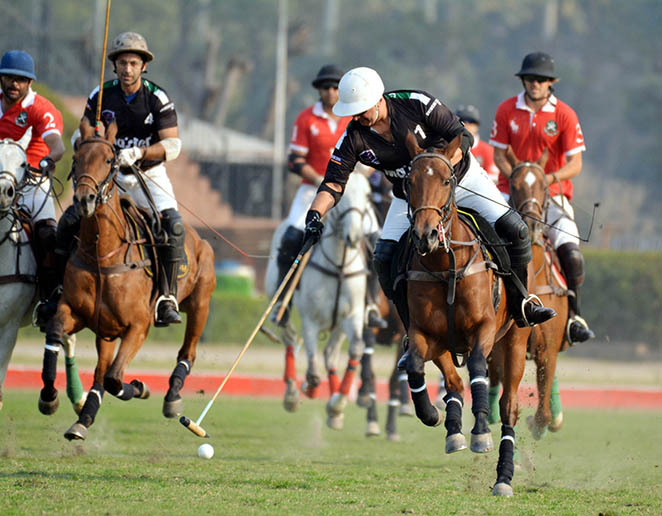 It is pertinent to mention here that earlier the name of the tournament was Winter Polo Cup, which was changed to Master Paints Polo Cup. Lahore Polo Club president Irfan Ali Hyder thanked Master Paints CEO Sufi M Amin and Director Farooq Amin Sufi for sponsoring the event and hoped that they would continue to support this game of kings and knights with more fervour.